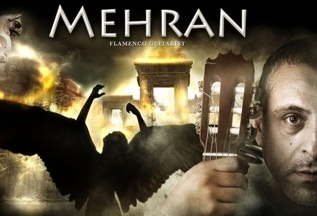 Mehran is an Iranian born Flamenco guitarist who resides in the states. His love for music started at the age 9 with the keyboards and at age 14 he started to study the guitar. Later in life he discovered Flamenco and his love affair with this music took him to Spain to study with several Maestros of Flamenco guitar. Originally he learned the traditional style but then he studied Jazz and transitioned into the modern Flamenco/Jazz. On this CD Mehran composed music with a unique sound that evokes a nostalgic blend of exotic worldliness. As he was composing this music he drew inspiration from the recent movement in Iran toward democracy and human rights. This CD is homage to this cause. “Angels of Persepolis” is a concept instrumental CD that features Flamenco guitar wizardry of Mehran, Iranian born Flamenco guitarist who resides in Chicago. The concept intertwines ancient Persian history, Persian mythology and Iran’s current affairs. This objective was reached by usage of sound effects, insertion of actual excerpts and sounds of the recent affairs in Iran and the mood translated by the music. The recording of this CD took exactly a year and in the beginning the concept was more cultural and focused on composing Flamenco guitar music with the theme of nostalgia and romanticism with some poetry. As the summer of 2009 brought with it a new and rejuvenated movement in Iran for freedom and basic human rights, the concept of this CD changed to that of support and raising awareness. As the world witnessed the silent and peaceful demonstrations of the Iranian people and how it was met with some of the most barbaric attacks a government can unleash on its people, it was then the concept of this CD started to get a form. Symbolically, Persepolis represents Iran and the angels are the men and women who have risen to ask for their rights. The news and images of these events that found their way all over the world, the bravery of the Iranian people and the manner in which they stood up to the face of tyranny were the inspiration behind most of the compositions on this CD. The entire CD is composed by Mehran except “yare Dabestani” which was composed by Mansour Tehrani but rearranged by Mehran. The music is a mixture of Flamenco, Jazz, classical and Persian music. Mehran used the talents of 13 different, very capable musicians during the course of this recording. Each one of the musicians were given the freedom to play their own accompaniment for the most part and when required, their own solos. We certainly hope that you enjoy this collection of music and appreciate this original sound and style.